Question to Radhanath Swami: We have been told that maha-mantra is the highest of all sound vibrations. Sometimes, what happens is that when we are in our locality or we are in our home, some of our relatives play Bollywood or Hollywood songs. So we are accustomed to that sound and so we start chanting maha-mantra in that particular tune. So will that give same benefit as we chant normally? And sometimes all the day long we chant mantra in that tune only. Is it beneficial? Answer by Radhanath Swami: Lord Chaitanya said,“There are no hard and fast rules for chanting.”So, if you chant to those tunes,it is very good. But if you chant to the tunes that our great acharyas have chanted, it is far better. 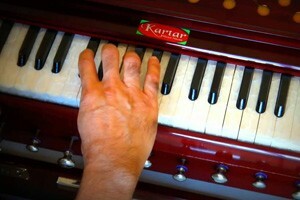 Anyway, if we chant with a sincere heart,in whatever tune, it is very nice if we chant the right mantras with feeling.